The story of Ghost continues as Papa Emeritus III has been disposed of for a new beginning (check out the videos on YouTube, it's very amusing!) and to herald this event, a new album has been released. 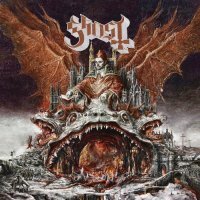 The new Papa – Tobias Forge (it's the same guy as last time, but we'll go with it anyway) – isn't a Papa at all, but a much slicker character who is more modern, wears less garb on his face and a cardinal; Cardinal Copia if anybody is interested, but who sings exactly like the previous Papa. I like this idea of having the story running behind everything else because, although it is supposed to be about people dying off and being replaced, the videos released on the internet have been quite amusing and alleviate the overall darkness of the inferred Satanic worship. Maybe this is the idea, to balance things out. 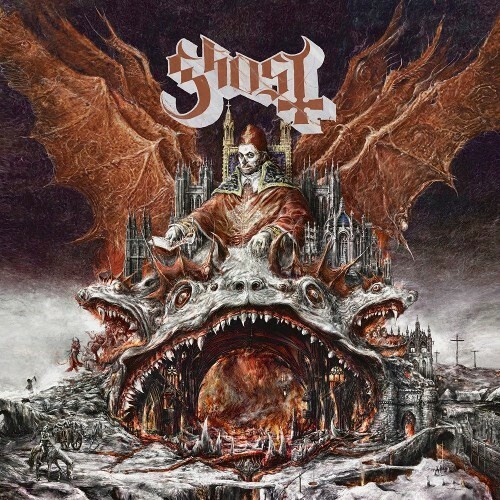 I have been a fan of Ghost since I first saw them a few years ago at their Download debut where I realised that musically there was a lot of Prog in there and visually they were awesome. It's not easy to maintain the standard when it is high from the beginning, so what does this latest release have for us? In truth, there's everything! The very short opener 'Ashes' invokes childhood innocence with what sounds like 'Ring-O-Roses', whereas 'Rats' bursts out and sinks its teeth into your neck, utilising the concept of Prog beautifully yet still being an out-and-out Heavy Rock song. It's worth noting that Prog does wave its banner considerably through this album. The almost-a-ballad 'See The Light' starts with church organ and choir, and there are two, yes two, instrumentals; 'Miasma' gets more grandiose and orchestral as it progresses (see what I did there? ), and it even has some saxophone in it, while 'Helvetesfonster' includes the appearance of some flute. Bloody hell! We'll be seeing the cardinal centre stage with a kick-drum and floating in the air next! The two main up-tempo songs are 'Faith', which sees Cardinal Copia as big brother (not the show! ), and 'Witch Image' where you will find another memorable chorus and lyrics that evoke Alice Cooper.